The Stylish Studio: Glue It: #4 This Weekend? Glue It: #4 This Weekend? Often when I'm painting I apply leftover paint across double pages in this book for "someday." "Someday" came this past week when I was in the cutting and gluing mood. 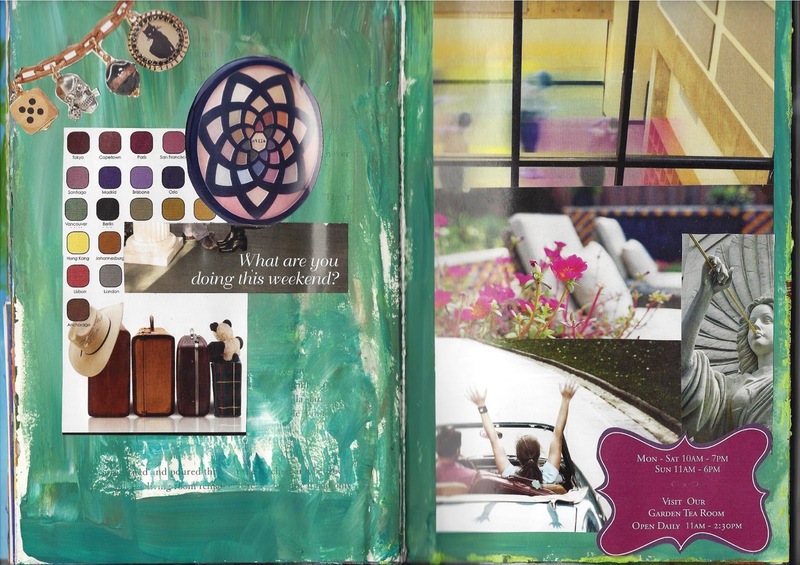 I started my collage with these green and brown splotchy, blotchy pages above. As you can see I let the text of the page appear. maroon piece about the "garden tea room"
and developed a color palette of pinks, lime greens and browns. Coincidentally a story developed of a weekend getaway. Whee! at Cinco Ranch High School in Katy. ~Cheryl Gee lives, loves and creates in Plano, Texas. She wonders what you are doing this weekend. ~"This Weekend?" is shared at Artysville's Glue It Tuesday and Mary Walker Designs Show Me What You Got Wednesdays.